Dynamation is a term which was coined by producer Charles Schneer when we started making black and white films together in the 1950s. 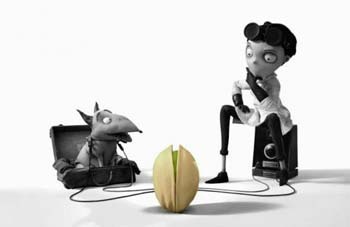 We specialised in combining live actors with animated models and, since nobody knew quite what stop motion photography was, they would call it an animated film. We were trying to establish a new division between cartoon and three-dimensional animation, so we came up with the word ‘Dynamation’ for that process. As the years went by, the publicity department felt that they had to enhance the word, so we got ‘Super Dynamation’! Georges Meliés experimented with stop motion photography in France before 1900 with his unique short film Trip to the Moon but it was Wilis O’Brien in America who first found a commercial use for stop motion. His greatest triumph was King Kong which set me off and I have never been the same since! It left such an impression on me that I felt it was the type of career I wanted, so I made it my business to find out how it was done – hence Dynamation sprang out of the basic O’Brien technique. The principle behind the technique is that we project a small picture of the live action. Unlike many companies who build 50ft models, we build small models and shrink the actors down to size in order to have control. The larger you go with complicated hydraulically controlled mechanisms, the less control you have – particularly in dramatic situations – so we use a small rear-projected image of the live action behind the animated model, sometimes adding matting process. When we were presented with the story of Gulliver’s Travels’ we wanted to make it as inexpensively as possible. We had heard of the yellow backing travelling matte process used in England at that time (1959) making its own matte instantaneously using a bi-pack camera. We thought that would simplify combining big people with little people. Since we had planned 150 travelling matte shots, we came to the UK to investigate and we have been here ever since. We used the yellow backing system on three pictures, then it suddenly went out of fashion. That was the darkest day I can remember. Now, of course, we use the blue backing system. We had just perfected the miniature projection duping process for Twenty Million Miles to Earth where you could hardly distinguish between the original negative and the Dynamation shots – and I would have liked to do the next picture that way – but Charles Spooner said you could not shoot an ‘Arabian Nights’ type picture in black and white, so we made The Seventh Voyage of Sinbad in colour. This took some experimenting as we did not have a choice of colour film which we could use for back projection plates. However, we took the plunge and it worked out quite well commercially. Not too many people found it objectionable to see rather grainy Dynamation shots intercut with the original negative. People who are technically minded are far more aware of that than the average cinema audience, although audiences today are very astute and certainly do not accept things that they would have done twenty years ago. One of the biggest problems with colour film is contrast and change of colour and we found that the new low contrast print film, designed mainly for television, was very useful. It is much easier to control the colour balance today than it was back in 1958, when you could not leave an unfinished shot in the camera overnight. If you did, it was quite evident the next day to see a colour change jump due to the California temperature drop during the night. Many times I set my own challenges and I find that my goal is always a little too high for the assets we have. I think that one of my greatest challenges was in Jason and the Argonauts where three men fight seven skeletons. That sequence presented a lot of problems and there were times when I averaged about thirteen frames per nine-hour day – which is less than one foot of film. The accountants got very uptight because they expected me to grind out the footage very much faster than that! It was necessary for me to handle all the skeletons myself as they had to be synchronised very intimately with the three miniature-projected swordsmen. The skeleton’s feet had to be fastened to the floor and, the minute they left the ground, I had to suspend them on wires for accurate control over the animation. Being keen to make the skeletons look professional, I studied fencing myself but unfortunately, I threw my hip out of joint and had to give it up! The whole fencing sequence had to be choreographed like a ballet and broken down into numbers. We had to pre-plan the cuts ahead of time through the storyboard – and I cannot stress enough how important that it. When you get on the set you do no want to have a lot of arguments and discussions on how shots should be set up. I always make a number of pre-production drawings which aid everyone concerned in visualising just what the final effect will look like on the screen. I always prefer to animate models of animals for exotic settings and situations instead of using real animals. It is so difficult to find a talented crab who will perform just the way you want, or a baboon who can play chess! You do not want to be at the whim and mercy of a lizard, hoping he will go from point A to point B in so many seconds. I find that real lizards become lethargic under the hot studio lights and barely blink or yawn for the benefit of the camera. 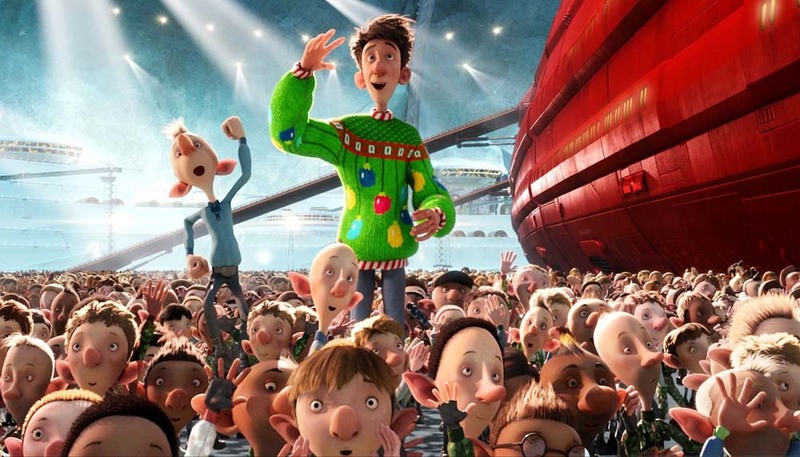 The animated ones will perform exactly as directed. For the bulk of the shots in our films I prefer to use miniature rear projection instead of travelling mattes because it’s easier to execute intimate interplay between actor and model. You have the projected image right there in front of you, rather than wait for weeks to see the combined effect from an optical printer. However, we do resort to many travelling matte shots which, in themselves, are very time consuming to put together. Dynamation is a word which really means using every trick in the trade – but there comes a point in the economics of doing stop motion animation where you cannot do as much as you would like to do in the way of retakes and careful matching. The time factor is quite considerable. The ideal situation in the future is the Chroma Key method as used in television. When this method has the same resolution as film, you will be able to make instantaneous travelling mattes. I believe that some companies are working on this at the moment. 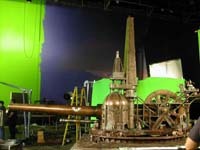 In recent years there has been a great exposé of the ‘behind the scenes’ details of making complicated special effects. 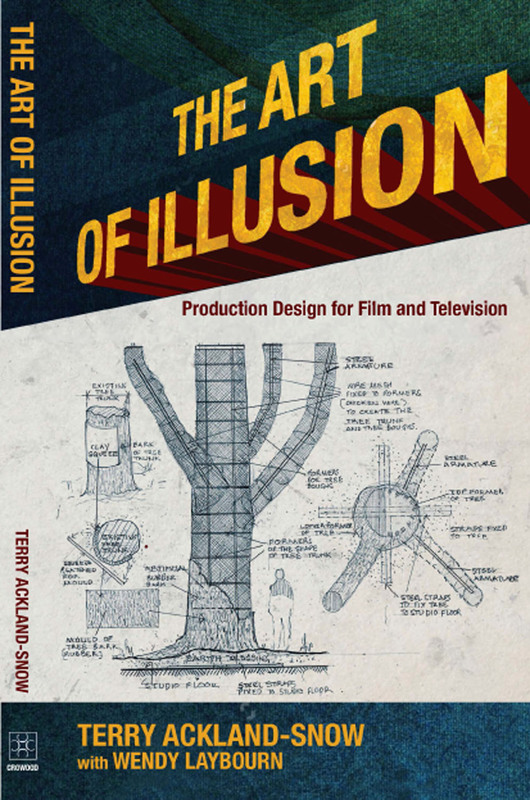 It is my belief that it rather spoils the illusion when the audience is told how it is achieved. It is like a stage magician who tells everyone how he achieves his illusions of magic – soon the audience loses interest in the show! I found going from Assistant to Junior Colourist very difficult as there was no set path. The leap from assisting on big films to grading is huge, at least 15 years of experience sat between myself and the colourists I had been assisting. I had already sort of taught myself how to grade, by watching the colourists, working through the manual, playing with the tools and grading shorts in my own time. I first discovered filmmaking during a summer course where I wrote and directed a 16mm short called ‘Noise’. I had just left school with little idea of what I wanted to do except for a general sense of creativity and this inspired me to study BTEC ND Media Moving Image at Lewisham College and BA(Hon) Broadcast Post-Production at Ravensbourne College of Design and Communication, as well as joining a number of young people’s filmmaking groups and courses, where I continued to experiment with filmmaking and animation throughout my studies. The transition to post-production came very naturally to me, as I found the seemingly limitless possibilities of digital tools incredibly creative. During my time at Ravensbourne where I was, in effect, training to be an editor, I discovered colour grading on an old Avid Symphony. There were only a few basic tools – saturation, brightness and so on – but seeing how they could transform an image was inspiring and, after discovering how to key and change a colour on Quantel I, was transfixed. Half way through my last year I decided to focus solely on colour grading and spent my work experience unit at Soho Images, as it was the only facility in London to have a laboratory for processing film, a telecine for grading rushes and digital intermediate for grading features, all in one location. I worked as a Runner but spent as much time as I could sitting with the Features Colourist Rob Pizzey, just watching what he did and asking the occasional question. He seemed to be impressed by these questions and he asked me to stay on, so I was offered a four day a week Runner position in the digital intermediate department – which is now known as Company 3 London. I did this job throughout the last term of university and so, by the time I graduated, I had already stopped being a Runner and was Assisting in scanning and recording. A few months later I was asked to assist Stephan Nakamura, a Colourist from Company 3 LA, who came to London to grade ‘Quantum of Solace’, although in reality it was the other way round with him very patiently teaching me how to colourtrace and do other basic tasks! After that project ended I carried on as Digital Intermediate Assistant and had the privilege to assist some of the best Colourists in the business, Rob Pizzey, Adam Glasman, Stefan Sonnenfeld, Stephan Nakamura and Mitch Paulson, on over 70 features. One of the most embarrassing things that happened while I was assisting and still learning the basics of grading, was when I was asked to do a grading test with a cinematographer I really admire, as the Colourist was unavailable. I was reassured that he would just tell me what he wanted me to do and it would be very simple – but every time he asked me to do something like ‘move the highlight towards magenta’ it would go the other way, the exact opposite – until he eventually gave up on the session. I then found out that there are two modes on the system, the Da Vinci Resolve – rank and vector. I was accustomed to using vector as it’s the default but the Colourist had his project set to rank, meaning that everything is the opposite like on the older systems – so I now double check before I begin! My proudest moments have always been when I’ve really pushed myself, which happens to some extent on every project I grade. 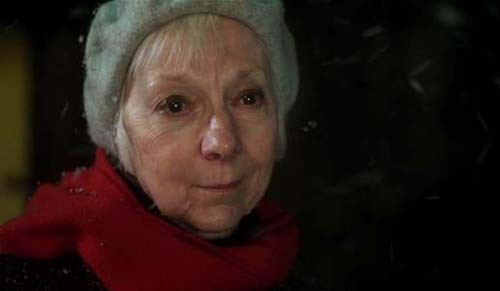 The best yet was asking one of our clients if I could grade the short she was editing, when I hadn’t yet done any – and then watching it on Sky Arts with my family on Christmas Day – which was pretty special and extremely rewarding as it kick-started me into grading my own projects. A disappointing occasion was when I was approached to grade a really great documentary after the director saw some of my work, but I was unable to meet their deadline and had to pass it up and it went on to win an extraordinary number of awards – but then really surprising things can happen too, I met a friend of a friend at a pub and went on to grade both of his shorts and will be grading his first feature later in the year. As my colleagues saw me doing this they began to give me little bits of work – or I asked and sometimes got a ‘yes’ – so slowly my confidence and their trust in my ability built up over the course of about three years until I was doing the video grades, trailers and affiliated commercials, cut changes, new shots and scenes, ‘outsourced’ shots with complicated grades, visual effect backplates and providing additional grading hours on big projects. Eventually, as clients responded well and I demonstrated that I was ready to take on ‘proper’ work, I was promoted to Junior Colourist. The work is similar to what I did before but the grading side, which of course I enjoy the most, has increased significantly, along with the prestige of the projects that I get to lead on. So, my advice to anyone wanting to make a career in post-production is to do as much work experience as possible whilst at university so you can find out exactly which aspect you want to pursue – be persistent, learn from your mistakes and, above all, be patient – there’s a lot to learn and there are no short cuts! 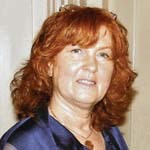 Aurora Shannon’s film credits include: Jack Ryan; The Counselor; Captain Phillips; Rush; World War Z; Les Miserables; Skyfall; Frankenweenie; Anna Karenina; Snow White & The Huntsman; Wrath of the Titans; The Woman in Black; The Iron Lady; The Best Exotic Marigold Hotel; The Inbetweeners Movie; The Decoy Bride; Paul; Prince of Persia – The Sands of Time; Nanny McPhee Returns; Green Zone. Television credits: The Gruffalo; The Promise; The Special Relationship. Los Angeles (July 16, 2013) – Today, the Visual Effects Society (VES), the industry’s professional honorary society, released “The State of the Global VFX Industry 2013,” a strategic analysis of the business drivers impacting all sectors of the VFX industry working in film production – those emanating from within the business infrastructure and those imposed by a global economy – and presentation of solutions to mitigate instability. Initial recommendations focus on improving business and financial management acumen among artists and facilities management through training programs and new standards and practices. The whitepaper is the first outcome of a working group of diverse industry stakeholders convened in March 2013 by the VES, which has committed its continued leadership to forge and execute a blueprint for action. This VES whitepaper is the result of a rigorous process, which incorporated input from more than three dozen industry representatives including artists, studio, business and labor leaders and facility executives, whose companies have operations in eight countries and 15 cities around the world, as well as data from several online surveys and published works. (Note: participants are listed in the paper under Section 5: Sources). 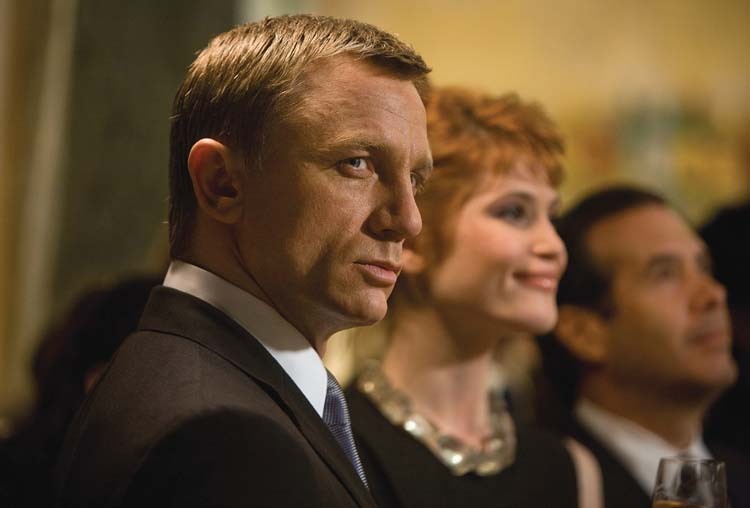 It was co-authored by two widely respected professionals, Carl Rosendahl, Associate Professor at the Entertainment Technology Center at Carnegie Mellon University and former President of PDI/DreamWorks, and Ken Williams, CEO and Executive Director of the Entertainment Technology Center at USC and co-founder of Sony Pictures Imageworks. Four complex independent drivers of this widespread industry shift were identified: growing competition nurtured by technological advancement and globalization; varying tax incentives and other government dynamics; industry dynamics related to an unpredictable production pipeline and pricing models for bidding and managing jobs; and non-business motivations that may contribute to counterproductive business decisions. In the category of impressionable factors, the immediate need to improve business knowledge for artists and facilities was widely cited among interview participants. As such, the paper presents a number of important actions the industry can adopt to increase business and financial management acumen, including: development of industry standards and practices; fixing current models; considering alternate pricing models to fixed price bidding; exploring flexible business and staffing models; and continuing to assess the relative costs/benefits of forming global business and labor organizations. The VES and its working group will advance this process through continued discussion and development of business guidelines, training program elements and other recommended ideas. In addition, a series of public forums on specific business and career management topics relevant to artists and facilities will be explored as opportunities to continue the public dialogue. On a location driven film when is it a waterfall and when is it a working model? When is a backdrop real and when is it a matte? This is the magic created by the skill and craft of the model and miniature effects workshop. When I reflect on the last thirty years and how I arrived at this point in my career, the key drive has been a philosophy of enthusiasm and positivity – a strong and continuing motivation to work in film and an optimism that the British Film Industry (and in parallel, my own career) will continue to be successful whatever obstructions are thrown in the way. Ever since I can remember I have had a keen interest in art (as I grew older this interest refined to painting, design and sculpture) and, of course, film. I was very fortunate to secure work experience at Pinewood Studios where I was able to marry my two great loves – art and film. Cliff Culley, who ran a matte painting company there, was impressed with the artwork I had taken to show him and employed me, along with four other teenagers. 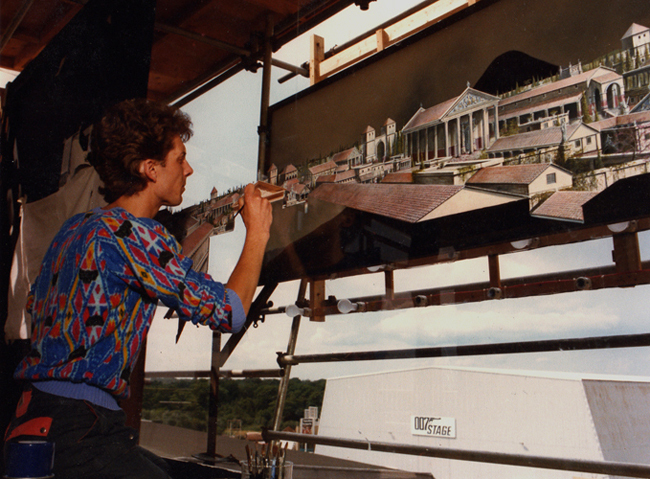 At that time, matte painting on glass was a very specialized thing with only a handful of people in the UK doing it, all of whom had ‘come up through the ranks’. I decided to make myself indispensable to Cliff, managing to help out in every way I could, from making the tea to making sure there was always a clean palette and brushes for Cliff every day that he came in to paint. 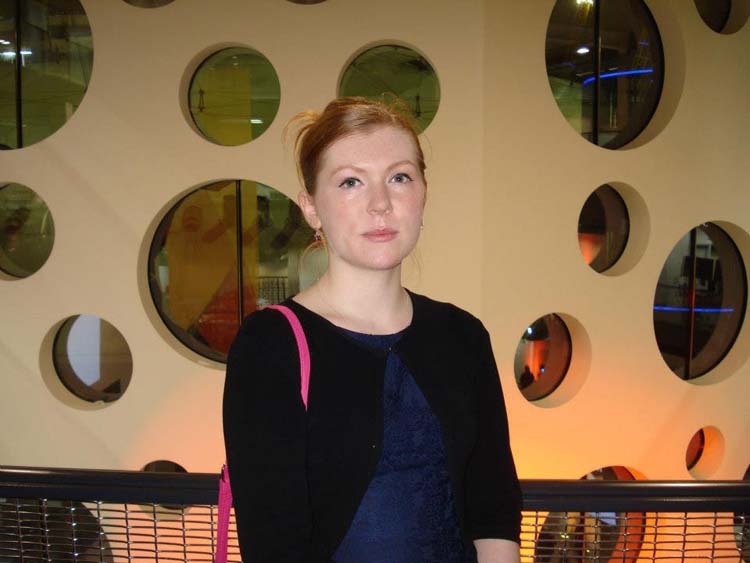 I became an apprentice and, as with any apprenticeship, the wages weren’t great – but without that initial opportunity I doubt I would be where I am today. 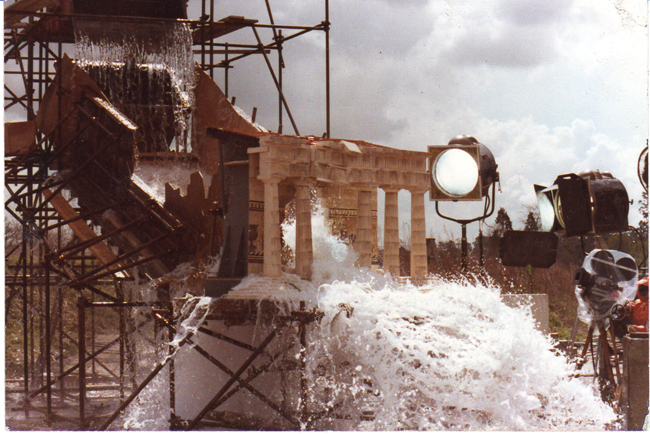 Amongst the first films I worked on as a trainee were ‘Warlords of Atlantis’ in 1978 and the Ray Harryhausen film, ‘Clash of the Titans’ in 1981, combining matte work with building miniature sets. Slowly, I got to do more drawing-up or delineation of shots, blocking in colours, steadily taking on more responsibility, until I reached the point where I could complete a shot from beginning to end, with Cliff adding a few dots and dashes to my work… after all, he was the boss! When we weren’t so busy, I’d use any spare time I had to improve my abilities in storyboarding, designing fictitious sets, developing imaginative solutions, and ways of achieving in-camera effects and optical processes in film and multiple exposures – always bearing in mind the real world of business … budget limitations! All this was done before the introduction of ‘digital’ and it was essential to be flexible and imaginative enough to come up with new techniques for achieving the effects that were needed.As my responsibilities increased and I was completing matte paintings myself, I learned not only how necessary it was to put 150% into every job, but also to handle comments from clients – whether good or bad! That feedback would always result in me wanting to do even better in the future – and I think that’s another thing that helps keep me going today, the desire to impress … basically, showing off! After then working for several years with the master of special effects, Derek Meddings, on films such as ‘Batman’, I started my own company, Mattes & Miniatures, and embraced digital technology. We are fully functional with a matte studio and model and special effects workshops which allow us to combine traditional film techniques with digital post production. 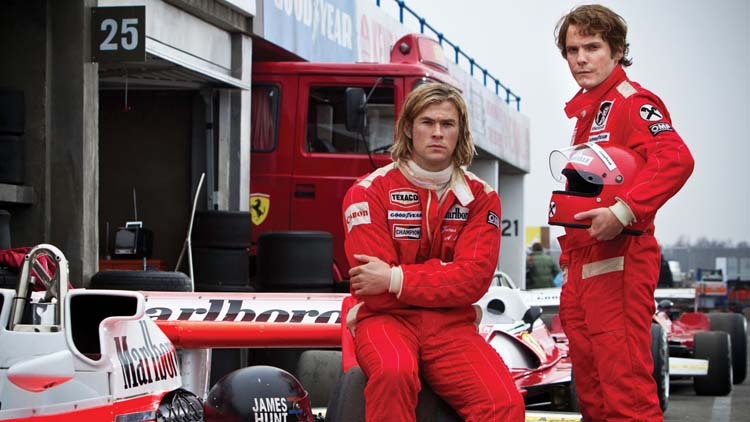 After 30 years, the drive hasn’t diminished and I still feel just as excited when I’m involved in big films as I did as a teenager. After meeting Terry Gilliam on ‘The Imaginarium of Doctor Parnassus’, I went completely mad for a few days, locking myself in the studio at Bray experimenting! Over the years I’ve built up a collection of equipment there – cameras, motion control, lights – everything needed to get creative! Ultimately we went on to build miniatures from his designs and had a fantastic time shooting them. When bidding on a film, we are usually sent pre-visuals and storyboards, sections of script and a list of requirements. 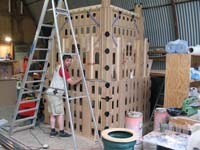 The fun starts with working out the best method of constructing a miniature – what it has to do, what scale to build it to – together with a breakdown of labour costs and materials. After the production has weighed up the methodology and costs, we wait for the go-ahead and, on receipt of a purchase order, invoice and, most importantly, money in the bank, it’s ‘all systems go’! Materials are ordered and technicians employed. Art Department drawings are provided in some cases and we are in constant contact with the director throughout the production. Terry Gilliam, as you might imagine, had a very clear vision in mind and so it was key to have his constant feedback as we were building the miniatures, as sometimes things that look OK on the drawing-board need to be modified once made as a 3D model (and of course everyone has to be clear of the budget ramifications of any changes to original specs). 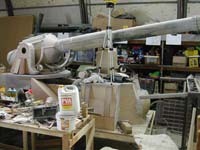 Other times, particularly on lower-budget productions, rather than starting everything at the same time we design and make on the go, showing designs to directors and perhaps discussing ways to make models by ‘recycling’ things already around the Aladdin’s Cave that is the Mattes & Miniatures workshop in Bray. This was our approach on ‘Mutant Chronicles’. Why bother to make miniatures at all? Why not just create the whole thing in CGI? Well – miniatures offer the opportunity to have a three-dimensional artifact which can be viewed by the camera lens as ‘real’ – and the model can be taken outside – there is no comparison to using actual daylight with a backdrop of trees and landscape in perspective with moving cloud patterns. I hope these highlights from my journey, together with a potted description of how I approach jobs, will be helpful to those similarly driven – those with a ‘lust for film’. At the end of my career, which I don’t envisage coming for a good 20 years or so yet (! ), nothing would please me more than to have the feeling that, through my own work, I have encouraged and helped others to pursue the career of their dreams and be successful in doing so. Leigh Took’s film credits include: Bohpal – 2013, The Wolfman – 2010, The Imaginarium of Doctor Parnassus – 2009, Angels & Demons – 2009, Inkheart – 2008, Mutant Chronicles – 2008, Stardust – 2007, Highlander, The Source – 2007, The DaVinci Code – 2006, The Descent – 2005, Ella Enchanted – 2004, Guest House Paradiso – 1999, Lost in Space – 1998, The Neverending Story II – 1990, The Rainbow Thief – 1990, Batman – 1989, The Adventures of Baron Munchhausen – 1988, Hawk the Slayer – 1980. Television credits include: The First Men in the Moon – 2010, Band of Brothers – 2001, The 10th Kingdom – 2000. 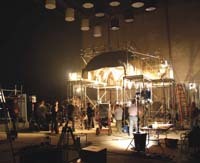 FORCED PERSPECTIVE is a technique developed not only for miniatures but in the construction of full-size film sets – for example, in a street scene, the buildings will start to condense towards the end of the road and perhaps a ramp will be used to create a false horizon (readers take note of the comments on the Supergirl set in Terry Ackland-Snow’s article) It is a natural follow-on that this technique is used in building miniatures which means that a quite large landscape can be fitted into a condensed layered form so that, from the camera’s point of view, it looks like the real thing. The camera position might need to be locked off in a particular position but it gives an opportunity to create depth of field in a miniature. LATENT IMAGING is an invisible image produced by the physical or chemical effects of light on the individual crystals (usually silver halide) of photographic emulsions; the development process makes the image visible, in the negative. Shoot a plate (a locked off shot of a landscape, say) then mask off the top half of the matte box on the front of the camera so you only expose half of the film. Take a small piece of that film to be processed then project that piece of film through the camera onto a piece of glass, then draw off the shot and extend it up and incorporate it with whatever is needed in the shot – eg castle or distant landscape or sky. Work on the matte painting and scrape away the bottom where the negative was projecting the plate footage, combining a painting with an unprocessed negative to create a final shot. FRONT PROJECTION – tiny reflective glass beads, which are an integral part of cinema projection screens, are used in front projection material. The actor (or subject) performs in front of the reflective screen with a movie camera pointing straight at him. In front of the camera is a beam-splitter – a one-way mirror angled at 45 degrees. At 90 degrees to the camera is a projector which casts a faint image of the background on to the one-way mirror which reflects the image onto the performer and the screen; the image is too faint to appear on the actor but shows up clearly on the screen. In this way, the actor becomes his own matte. The combined image is transmitted through the one-way mirror and recorded by the camera. 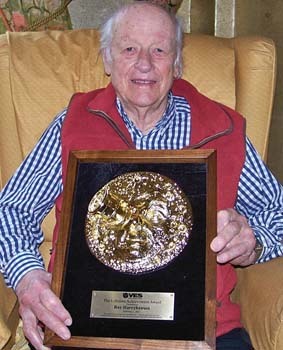 I met Ray Harryhausen several times over the past few years. Apart from being hugely talented, he was very generous with his time, especially with young people, always more than happy to talk about his work and pass on snippets of information – all in all, a very nice man. When I started Network Nine News magazine in 2009, he sent a very encouraging and supportive message which included the phrase …‘it is almost forgotten that it takes a team of many people with talent to make a motion picture’…. I took this as an immense compliment that Ray Harryhausen had taken the time, not only to send the message in the first place, but that he had fully appreciated the reason I started Network Nine News in the first place. 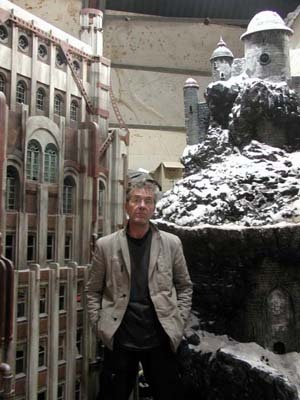 He was an Honorary Fellow of the BKSTS and became a Lifetime Member of the Visual Effects Society in 2011. Born in Los Angeles in June 1920, Raymond Frederick Harryhausen had a passion for dinosaurs as a child that led him to make his own versions of prehistoric creatures. 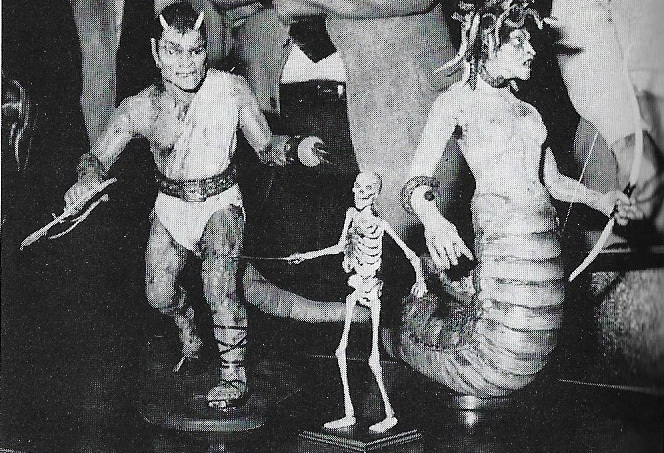 Films like 1925’s ‘The Lost World’ and the 1933 version of ‘King Kong’ stoked that passion and prompted him to seek out a meeting with Willis O’Brien, a pioneer in the field of model animation. Harryhausen went on to make some of the fantasy genre’s best-known movies, amongst them ‘Mighty Joe Young, One Million Years BC’. and a series of films based on the adventures of ‘Sinbad the Sailor’. 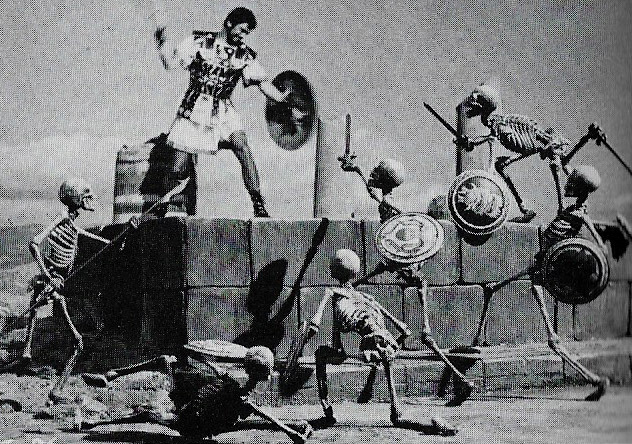 He is perhaps best remembered for animating the seven skeletons who come to life in ‘Jason & The Argonauts’, a sequence which took him three months to film – and for the Medusa who turned men to stone in ‘Clash of the Titans’. Harryhausen inspired a generation of film directors, from Steven Spielberg and James Cameron to Peter Jackson of the ‘Lord of the Rings’ fame. The veteran animator donated his complete collection – about 20,000 objects – to the National Media Museum in Bradford in 2010.